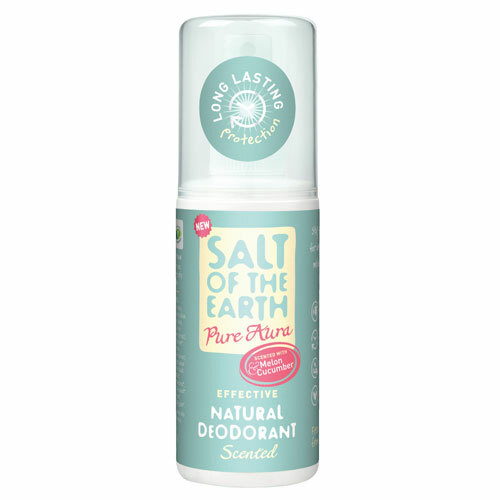 Stay fresh and odour-free for longer with Salt of the Earth`s super new melon & cucumber natural deodorant spray. Aqua, Potassium Alum, Polyglyceryl-10 Laurate, Aloe Barbadensis Leaf Juice, Lonicera Caprifolium (Honeysuckle) Flower Extract, Sclerotium gum, Parfum*, Lonicera Japonica (Honeysuckle) Flower Extract, Sodium Anisate (from anise seed or fennel), Citric Acid. Hydroxycitronellal*, Limonene*, Benzyl Alcohol*, Citral*, Citronellol*, Geraniol*, Linalool*, Farnesol*, Benzyl Salicylate*, Eugenol*. Shake before use, spray on clean dry underarms. Do not apply to damaged or broken skin. 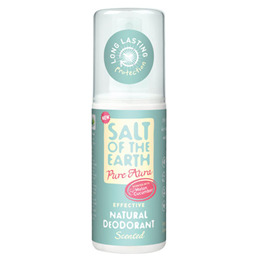 Below are reviews of Salt of the Earth Pure Aura Deodorant Spray - 100ml by bodykind customers. If you have tried this product we'd love to hear what you think so please leave a review. My daughter has tried a few natural deodorants and this one is one of the only ones that works and smells lovely too. I was disappointed - this deodorant smells like bubblegum. Love this new flava! Works just as well as the award winning pink one, (we also love that one, too) This is FRESH = great for summer.